Fig. 1. Network diagram of the object processing model (Tagamets & Horwitz 1998; Husain et al. 2004). The regions of each model form a complex network of feedforward and feedback connections; these interregional connections can be either excitatory (excitatory-to-excitatory elements, shown as solid lines) or inhibitory (excitatory-to-inhibitory elements, shown as dashed lines). Regions specific to the visual model (LGN, V1-V2, V4, IT) are shown in red; regions specific to the auditory model (MGN, A1-A2, Aii, ST) are shown in blue; the prefrontal module is structured in the same way in both models. The sub-modules for each model are also indicated. 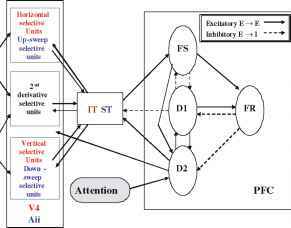 In the PFC region, there are four submodules: FS contains stimulussensitive units, D1 and D2 contain units active during the delay part of a delayed match-to-sample task, and FR contains units whose activity increases if there is a match between the first and second stimuli of a trial. Abbreviations: LGN - lateral geniculate nucleus; MGN - medial geniculate nucleus; Aii - secondary sensory auditory cortex; PFC - prefrontal cortex assemblies of basic units, each of which is an interacting excitatory-inhibitory leaky integrator neuronal pair that represents a simplified cortical column (Wilson & Cowan 1972). Although there are many attributes that can be used to characterize an object (e.g., shape, color, texture), we chose to focus on shape and assumed that the basic feature, based on the work of Hubel and Wiesel (Hubel & Wiesel 1977), is line orientation. So, the excitatory neurons in the V1/V2 module were constructed to respond in a retinotopically configured manner to lines oriented in particular directions (for computational simplicity, we use only horizontal and vertical lines). The V4 module is similar to the V1/V2 one in that it is retinotopically organized, and contains neurons with horizontal and vertical line orientation selectivity. It also contains neurons that respond to a combination of features (i.e., neurons that respond best to a change in line orientation, what can be called second-derivative neurons). Importantly, the receptive field of these neurons, like those of actual V4 neurons, are larger than those for V1/V2 neurons (by about a factor of 3). This was achieved by increasing both the divergence and sparseness of connections in the feedforward direction, with neighboring V1/V2 units sending connections to neighboring V4 units. Likewise, V4 units project to IT with the same 3-fold divergence, with the result that IT units no longer show retinotopy and each IT neuron's receptive field is essentially the entire visual field, which is the situation with real IT neurons (Desimone et al. 1984). The upshot of this is that a visual object is represented in IT in a highly distributive manner. In the PFC module, we have four submodules whose neuronal units have the response properties based on the findings of Funahashi et al. (1990): units that respond when a visual stimulus is present, two kinds of units that show activity during the delay interval, and units whose activities increase when a match between the second and first stimuli occurs. A particular arrangement of connectivity between these four submodules, and between these submodules and the other regions, enable a short-term memory trace to be maintained during the delay interval between the presentation of the two stimuli in the DMS task. Feedforward and feedback connections between regions were based, where available, on primate neuroanatomical data. Parameters were chosen so that the excitatory neuronal elements of each module had simulated neuronal activities resembling those found in electrophysiological recordings from monkeys performing similar tasks (e.g., Funahashi et al. 1990). The method by which the "task instructions" are implemented, so that the model knows whether to perform the DMS task or a control task, is by means of a continuous "attention" or "biasing" variable that modulates a subset of prefrontal units by means of diffuse synaptic inputs. 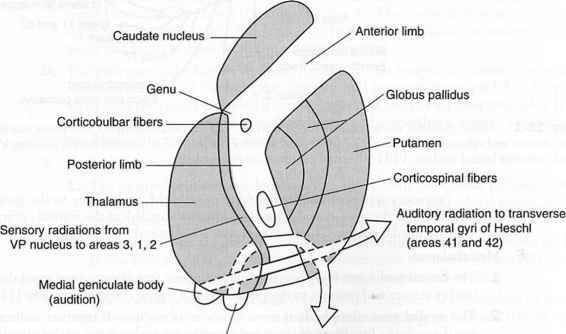 These prefrontal units, through feedback connections, modulate activity in posterior areas. The strength of the biasing variable controls whether the stimuli are maintained in short-term memory or not. As a consequence, activity in each brain area is a mixture of feedforward activity ("bottom-up") determined in part by the presence of an input stimulus, feedback activity ("top-down") determined in part by the strength of the biasing attention signal, and local activity within each region. Functional neuroimaging studies are simulated by presenting stimuli to an area of the model representing the lateral geniculate nucleus (LGN) for the visual model. Approximately 10 such trials per condition would be used for a PET or fMRI study. To simulate the data acquired in a PET scan, we integrated the absolute value of the summed synaptic activities in each brain region over all the trials, separately, for the DMS condition and for a control condition ('passive' viewing of degraded shapes) (Tagamets & Horwitz 1998). In the case of fMRI, regional activity is simulated by first temporally and spatially integrating the absolute value of the synaptic activity in each region over a time period representing 50-100msec, which corresponds to the time needed to collect a single slice of fMRI data. The time integrated synaptic activities are then convolved with a function representing hemodynamic delay, and subsequently sampled at a time corresponding to the repetition time (TR) of an fMRI scan (Horwitz & Tagamets 1999).